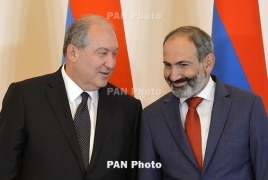 PanARMENIAN.Net - President Armen Sarkissian on Monday, January 14 appointed Nikol Pashinyan in the post of the Armenian Prime Minister. Pashinyan first came to power after leading a nationwide campaign to oust the former authorities. Following months of peaceful protests, then PM and former President Serzh Sargsyan resigned, while the parliament elected Pashinyan as the country's new Prime Minister. The National Assembly was then dissolved and new members of parliament were elected on December 9.